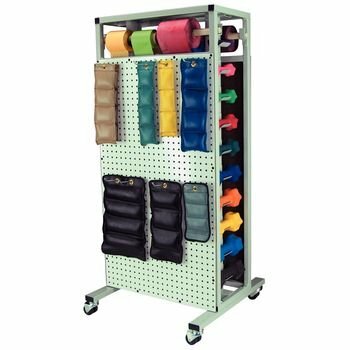 Multi-use storage rack contains all physical therapy and exercise equipment in one easy-to-roll, versatile rack. Hang resistance band rolls, line up cuff weights, and stack dumbbells for easy access whenever you need them. Dual wheel swivel casters let you store up to 500 pounds of weights and easily move them out of the way. Exercise supplies sold separately.